Nipper Lives On! An Interview with Trish SaundersAlan Blumlein, grandson of inventor and war hero Alan Dower Blumlein today honours his grandfather on his 114 birthday. Jersey Post has released a new King George VI ‘Miniature Sheet’, featuring a photograph of the King making a radio broadcast to the nation after the outbreak of World War II. In addition, the sheet also features an image of the King’s beautifully crafted, EMI commissioned ‘H.M. King George VI Microphone’. 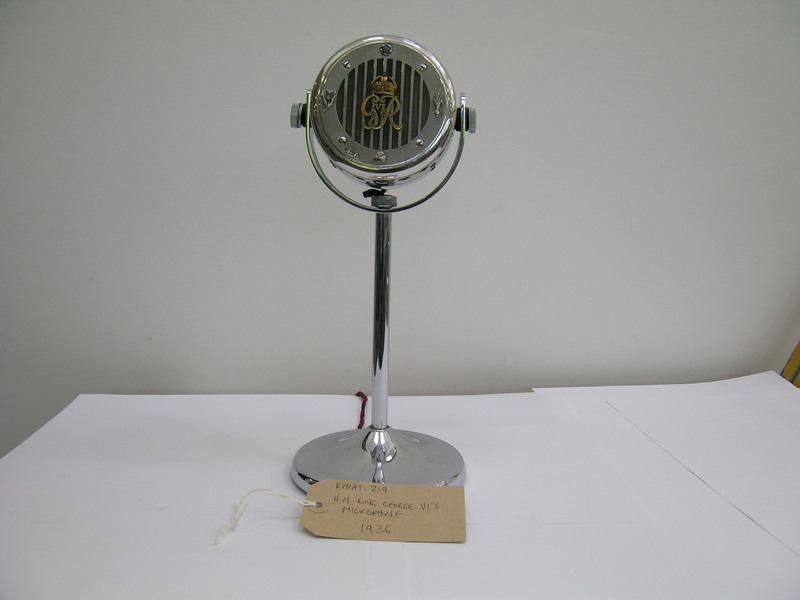 This microphone was specially made for H.M. King George VI by EMI and was first used for the opening of the Maritime Museum at Greenwich on April 27, 1937. EMI commissioned beautiful microphones for a succession of monarchs to record their speeches. The microphones of H.M. King George V, H.M. King George VI and H.M. Queen Elizabeth the Queen Mother were recently restored and used by Abbey Road Studios to record the soundtrack of the film The Kings’ Speech, about the wartime speeches of H.M. King George VI. In April of this year, Prince William unveiled the very same microphone at the official opening of the Global Academy technical college in Hayes. The EMI Archive works closely with the college on student projects, work experience, internships and local community campaigns and as part of the launch, rare pieces of royal memorabilia held by the Archive were displayed for the students, parents and Royal attendees. 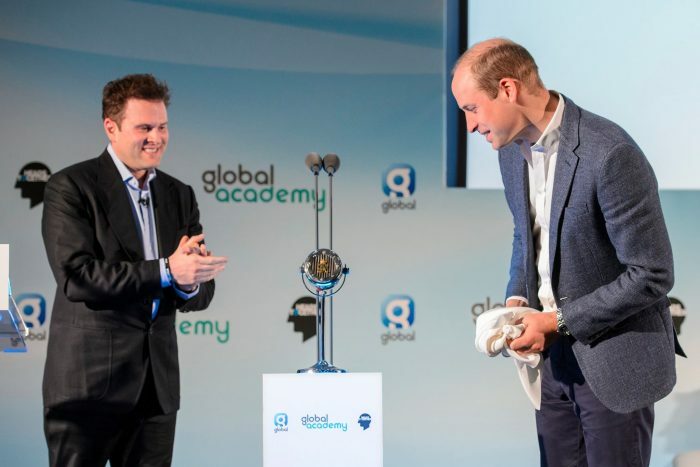 Prince William declared Global’s Academy officially open and unveiled the original microphone that was commissioned by EMI for his great grandfather, King George VI. Photograph copyright Global. Popular with collectors, a ‘Miniature Sheet’ is a stamp within a decorative surround. 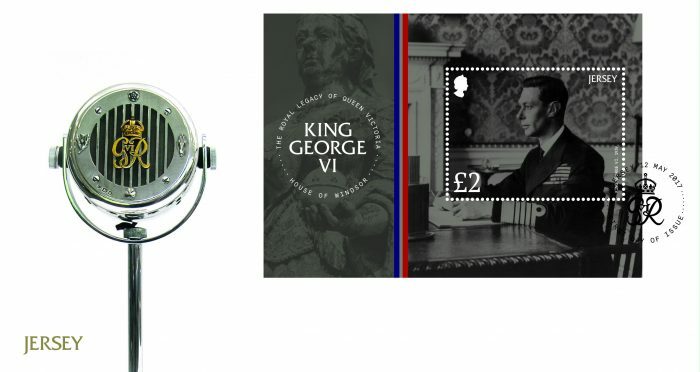 The King George VI issue was released on Friday May 12 as part of an ongoing stamp series celebrating the Royal Legacy of Queen Victoria, comprising six stamps and a Miniature Sheet.